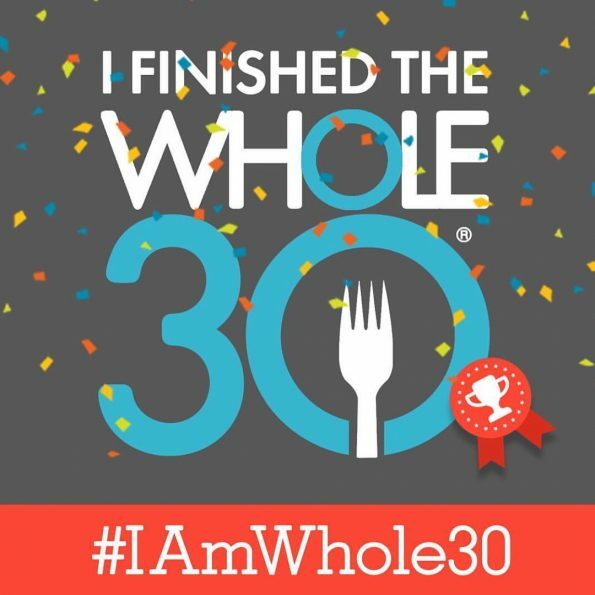 I finished the Whole30!! Wow, I kind of can’t believe I did it! I didn’t do a full post about my 4th and final week (more like final 10 days) because it was SO boring and I really kind of struggled through. My meals felt really thrown together and uninspired. Here are links to my recaps of Week 1, Week 2, and Week 3 if you missed it! 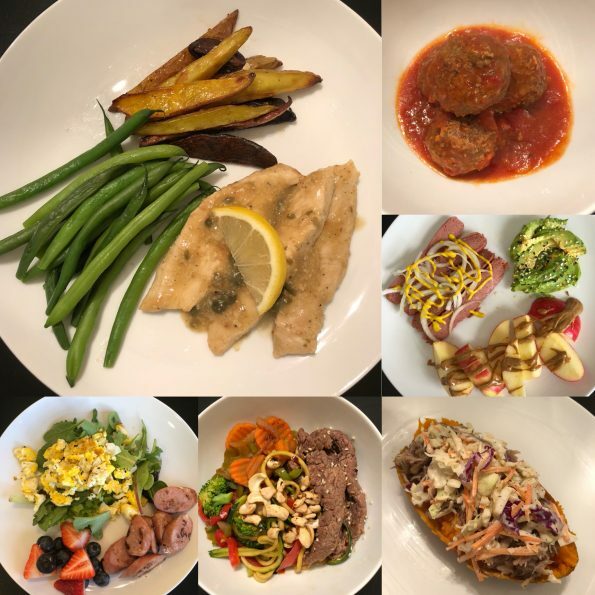 And here is a little collage of a few of my meals on the final 10 days. At the end of 30 days, I didn’t notice much in the way I was feeling. There weren’t any noticeable changes in my sleep, my skin, my digestion, or my weight. They say that if you do the Whole30 with an autoimmune disease that it may take longer to feel the effects. I couldn’t do it any longer because I was heading to DisneyWorld a week later and needed a few days for reintroduction. So if I didn’t notice any changes, would I do it again? I have learned so much more about noticing what is in the food I buy and put in my body. Also, I learned the importance of eating a healthy, whole-foods based breakfast (I struggle the most with my first meal of the day), and incorporating fresh fruits and vegetables in every meal. I’m back to eating pizza now and a little bit of cheese here and there, but no milk, ice cream, yogurt, cream cheese, or coffee creamer. Instead I’ve been using non-dairy alternatives made from almond milk and coconut milk. I don’t miss any of the dairy things. I have also added back rice and bread products – but, I honestly think I could do away with the breads. They’re not necessary for me and I think I just eat them out of convenience and lack of meal preparation. Oh desserts. I can’t give you up!! I have a sweet tooth. Enough said. Snacking is another thing that I was surprised about during my 30 days. I didn’t miss it. And I think that’s all due to the fact that I was eating nutrient dense food that was keeping me fuller for longer. One thing that I have always struggled with was low blood sugar. It brings on the “hangry-ness” in me. I didn’t feel like that AT ALL doing the Whole30. I just felt like I wanted snacks only because it was habit or because I was bored or needed to fulfill something else and not because I was hypoglycemic. I need some kind of crackers/crunchy things in my life. Crackers and chips aren’t allowed on Whole30 but I definitely need crunchy things in my life! One major thing that I took away from my month of clean eating is to avoid added sugars in things and really try to eat foods without additives. My husband bought some bacon at Costco and I couldn’t eat it because it was so sugary. Now I prefer the no-sugar bacon because it is just the flavor of the meat, like it should be! So much better. When will I do it again? I don’t know when I will do it again, but I do know that I will. I have some fun vacations coming up this spring and summer so I need to kind of plan my next Whole30 around those things. This is a great program especially for those that need a little help to figure out how their body reacts to certain foods. It’s a great program and I’ve heard wonderful things about people like myself with autoimmune issues that have been healed by eliminating certain things in their diet. This program is not a diet, it’s a reset. It is a reset in paying attention to what you are putting in your body. I hope to use the things that I’ve learned on the program while I continue to heal my body with a gluten-free diet. **Please remember that I am not a medical professional and this is only my personal opinion so please speak with your doctor before you start any nutrition program.